Remember when you were a kid and a friend would send you a birthday party invitation to a local roller rink? Did you get excited? Because I didn’t. I’d look at my mother, pleading with her not to go, no matter how good the friend, because I was in fear. Fear of wheels. As a wheel-o-phobe, I delayed getting my driver’s license, never learned how to ride a bike, and banished the idea of roller skates to a hell of embarrassing childhood memories I never wanted to resurface. So, in the summer of 2011, my decision to join roller derby was, in fact, earth shattering (or, the more likely outcome, face shattering). I had moved to Charlottesville that January, knowing vaguely of one person, Claire and Present Danger, then the chair of CDD’s Productions Committee in charge of putting on the bouts. Danger spoke so enthusiastically of the Derby Dames, I had to check them out. I was looking to get a taste of C’ville off-Grounds from my University work-life, and I was somewhat interested in getting in shape. After one bout during which I was drafted as a non-skating official (with no idea of the rules or what the heck was going on), I was intrigued. Danger turned three of us that summer into derby lovers, and it changed all of our lives forever. So there I was, July 2011, sitting on a bench with these things called skates strapped on my feet. Danger was sitting on one side of me, B-One Bomber on the other. Other Fresh Meat were up and whipping around the track ready to learn basic skills of a full contact sport. I was just hoping to avoid my face’s full contact with the floor. I was petrified. The nightmares of skating rink parties came back, and the only physical shape I was in could be equated to a blobby amoeba. “Well, drive your force straight down into the floor and stand up,” drilled Danger. I thought about this for a while, drawing force diagrams in my mind, and when I was satisfied that I could understand a world is which the forces would be balanced and I wouldn’t fall over, I stood up. “OK, good. Now go forward.” Forward? That’s a good goal, but I couldn’t make sense of it. I looked back at them and asked, “How do you propel?” Half an hour later, I was ungracefully zombie shuffling my way forward. Danger screamed after me, “Bend your knees or I’ll bend them for you!” I always knew she had my back. Looking back, I was also in fear of joining an athletic team. After some pretty terrible team social experiences in middle school and high school, I decided that with a full-figured, short shape, team sports were not for me. But at that first Fresh Meat practice, I changed my thoughts completely. 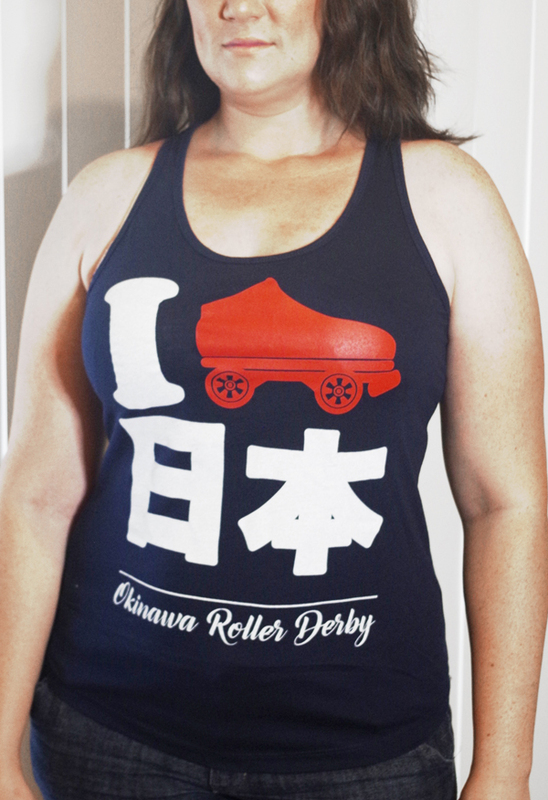 The Derby Dames embrace everyone for who they are, no matter what shape, background, or beliefs they have. (And literally embrace, too. Every time I shuffled to and from the wall, Crashiopeia would give me a hug and tell me to do it again.) I have never seen a more supportive group of people, and because of the way they open their arms to all of us Freshies, I kept coming back for more. I spent 18 months in Fresh Meat hoping to test to Level 1. Though I became “seasoned meat,” not once did anyone discourage me from continuing. Our Fresh Meat Butcher at the time, War N Peas, would make the main group do long exercises while coming over to give me tips to practice. My derby wife, the lovely Venom Assassin, pushed me to practice hard, even though she had what we call one of the “nine-month injuries” (pregnancy) during that time. In January of 2013, we both passed our Level 1 test. There were tears, and not of the kind after smashing your face into the floor. Thank goodness. Joining Fresh Meat is one of the best decisions I’ve ever made. It’s for anyone looking to get in shape, develop a new persona, see a different side of C’ville, or meet a new group of really good people. Derby has become something that defines the best of Charlottesville for me, and I can’t wait to meet all of you potential Freshies out there and help you learn to not smash your face into the floor. Le Bruise (center, bottom row) in Fresh Meat.